Groups are highlighting the benefits of and planning outreach efforts for Obamacare. In a little more than 100 days, Obamacare health insurance exchanges in each state will open for enrollment. But a lot of Americans don't know that. That's why advocacy groups around the nation are stepping up their efforts to educate consumers about the options that could be available to them through Obamacare, formally known as the Affordable Care Act, come October 1. Enroll America, a coalition of community organizations, health groups and businesses, is working with partners to hold more than 75 events in 27 states this weekend. The programs, which include door-to-door visits, talking to people at churches and setting up tables at neighborhood gatherings, are aimed at telling the uninsured and underinsured about the plans that they could be eligible for next year. They will provide information about the suite of essential benefits -- including drugs, mental health and emergency room coverage -- that must be included in each plan, as well as the financial assistance available to those who need it. "We are keeping the message simple and focused on things people need to hear [about] the health care options best for them and their families," said Anne Filipic, president of Enroll America. Another group that will get the word out this weekend is the Texas Organizing Project. It plans to ramp up its outreach efforts with three workshops in Dallas aimed at reaching the uninsured. For the past few weeks, members have been sending out fliers, knocking on doors and setting up phone banks. The goal is to engage with tens of thousands of families before enrollment begins. "Because we have such a high rate of uninsured in Texas, it's important that those who qualify for ACA enroll," said Connie Paredes, a member of the project, noting that many people don't think they are eligible to participate. Starting in 2014, all Americans must have insurance either through their employer or an individual plan. Otherwise, they will face annual penalties of $95 or 1% of family income (whichever is greater) initially and more in subsequent years. Those who lack affordable insurance will be able to sign up through state-based exchanges, with coverage kicking in in January. The federal government will offer premium subsidies to those with incomes of up to four times the federal poverty level. This year, that's $45,960 for an individual or $94,200 for a family of four. But relatively few people understand Obamacare. Only 48% of the uninsured and 31% of those who buy their own coverage think they will be better off under the health reform law, a recent Kaiser Family Foundation poll found. And some 78% of the uninsured don't know they'll be able to purchase insurance through the exchanges, according to Enroll America. The Obama administration is particularly focused on getting younger, healthier Americans to enroll, since they will help lower premium costs. To that end, the Young Invincibles advocacy group launched a website this week to inform young adults about coverage options under Obamacare. It answers questions on whether the young and healthy need insurance and where they can go for more help. The group also has an app that will provide more information on the law and the exchanges. 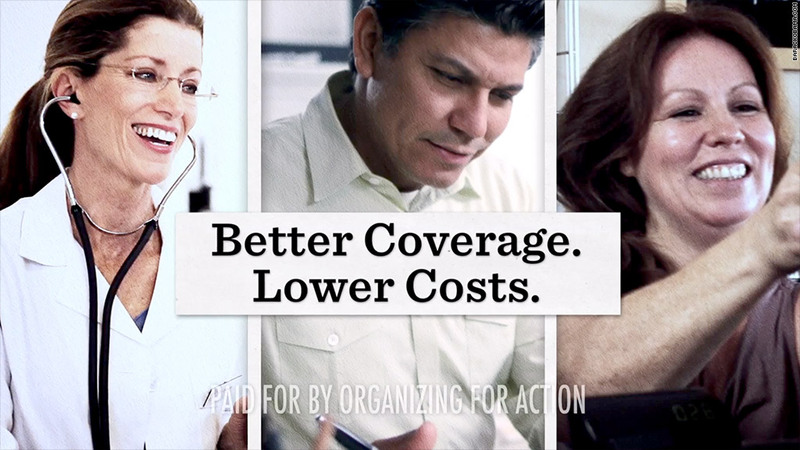 Organizing for Action, which evolved from the president's 2012 re-election initiative, is highlighting the benefits already available under Obamacare. It began running ads this week showing the financial savings people have already experienced. It will shift to enrollment-focused ads in the fall. All of these efforts come on top of outreach initiatives that the White House plans to launch in coming weeks. By month's end, it will debut a call center where people can get information about enrolling in the exchanges. The administration will also relaunch its healthcare.gov website to provide more details on coverage options. Later in the summer, a nationwide network of counselors and agents will be able to provide in-person assistance to those looking to enroll. "We are planning an aggressive outreach effort that includes coordination with work being done at the state level and by our many private and non-profit partners who are highly energized to educate people about the benefits of the law," said Joanne Peters, spokeswoman for the Department of Health and Human Services.